Heute haben wir den Freistellungsbescheid vom Finanzamt bekommen. 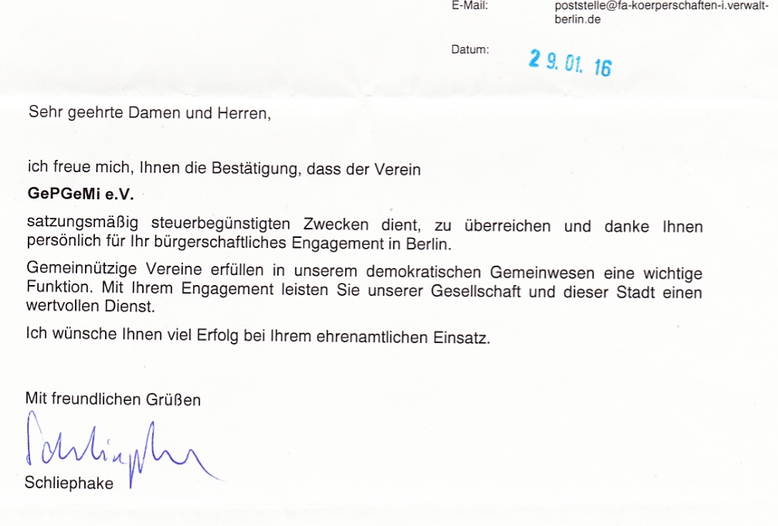 Das ist eine Anerkennung vom Finanzamt, dass die Arbeiten von GePGeMi e.V. gemeinnützigen Zwecken dienen. I do not even understand how I ended up right here, but I believed this post was once great. I do not know who you might be but definitely you are going to a well-known blogger in the event you are not already. Cheers! Hello, i think that i saw you visited my web site thus i came to �return the favor�.I'm attempting to find things to improve my site!I suppose its ok to use some of your ideas! !